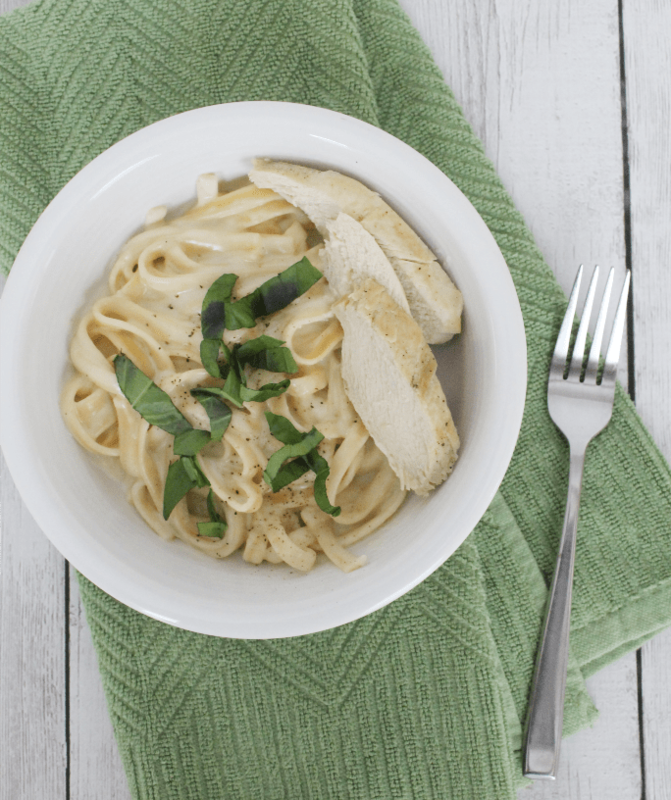 Pressure cooker chicken fettucine alfredo is an easy way to get a restaurant-style meal on the table for a fraction of the cost! Italian cuisine (even “Americanized” Italian cuisine) is one of my favorite types of food. Honestly, something Italian-themed is on my meal plan at least a couple of times each week. It’s just so good! Growing up, we didn’t eat out at restaurants a whole lot, but when we did, one of my favorite go-to meals was fettucine alfredo. It’s not a meal we ever really ate at home, so it was a treat to have it at the restaurant. Because really, what’s not to love about tender noodles bathed in a creamy parmesan sauce and topped with chicken? 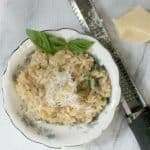 After I started cooking for myself as a new college graduate, I turned to jarred alfredo sauce to make my restaurant favorite at home. Only it just never was quite as good. I’m sure there are some decent jarred sauces on the market, but my budget brands weren’t cutting it. A few years later, I learned how to make the sauce from scratch. And let me tell you–that stuff was good. The real deal. Only trouble was, it took some time to make it. Not that it was a super involved process, but when you have little rugrats running around, you need all the shortcuts you can get. 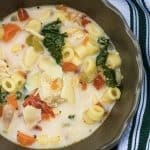 That’s why I was so excited to find a recipe for pressure cooker chicken fettucine alfredo in The Electric Pressure Cooker Cookbook by Barbara Schieving. First off, let me just say that this cookbook is one of my recent favorites. It’s one of the best pressure cooker cookbooks and the one I recommend the most. So if you don’t have a copy, you should get one! 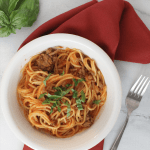 I love using my Instant Pot for as many things as possible–it’s one of my favorite appliances because it simplifies cooking so much. And making pressure cooker pasta recipes is incredibly easy! 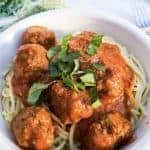 I took Barbara’s recipe as a starting point and made a few changes to suit my preferences and the ingredients I had on-hand. It was a hit! 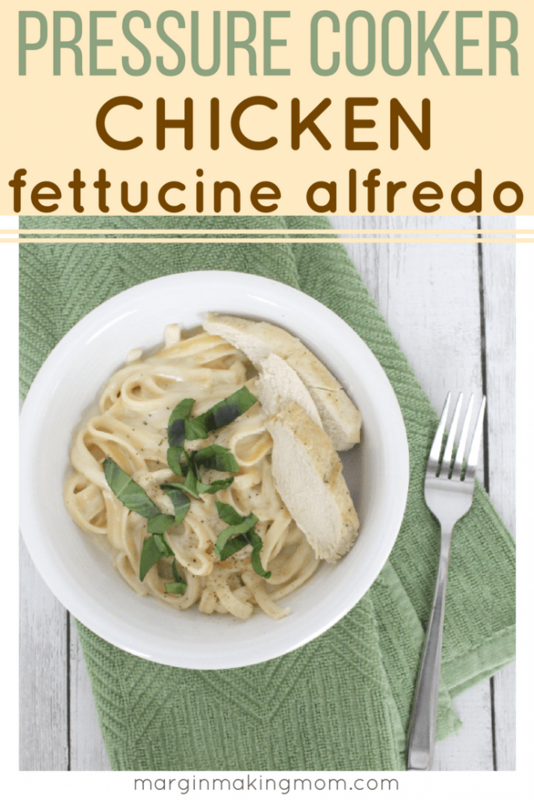 Not only that, but making chicken fettucine alfredo in the Instant Pot was such an easy meal to make. You’ll love the fact that this recipe is truly a one-pot meal. No grilling the chicken, then making the sauce in one pan and boiling the noodles in another. Everything cooks in the pressure cooker, which–let’s be honest–is a solid win. And not having to turn on my stove in the middle of June? Another win! The process is really quite simple, allowing you to quickly prepare a restaurant-quality meal for your family. Not only that, but it’s waaaaayyy cheaper than eating out. I do recommend using good-quality parmesan cheese in this recipe. The powdered kind in a can has a tendency to clump up in the hot water. If you can grate your own, that’s the best option! 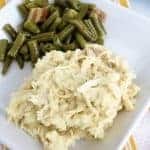 Add this pressure cooker chicken fettucine alfredo to your meal plan and enjoy a delicious, easy, and inexpensive meal for your family! 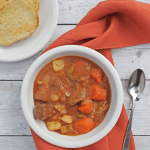 You can click here to learn more about how to make easy pressure cooker recipes. Season both sides of the chicken with a generous sprinkling of salt and pepper as well as the garlic powder. Add the butter and olive oil to the insert pot of the Instant Pot. Use the Saute feature to heat the insert pot. Once the butter has melted, add the chicken to the insert pot. Brown chicken on each side, about 3 minutes per side. Remove the chicken to a plate. Add chicken broth to insert pot and deglaze the insert pot by scraping up any brown bits with a spoon or spatula. Return chicken to the insert pot. Place the fettucine on top of the chicken and add enough of the 3.5 cups of water to just barely cover the pasta. Press Cancel/Keep Warm to turn off the Saute function. Place the lid onto the Instant Pot and lock in place. Set the vent to the Sealed position. Using the Manual/Pressure Cook setting, select a 5 minute cook time at high pressure. Once the cook time is complete, turn off the pressure cooker and perform a qiuck release of pressure. After the valve drops, carefully remove the lid. Stir contents. Remove chicken and set aside. Gradually add the Parmesan to the insert pot in small increments until melted. Add heavy cream and stir. Turn on the Saute function. In a small bowl or mug, whisk together the cornstarch and cold water to create a slurry. Add the slurry to the insert pot, stirring until the sauce thickens. 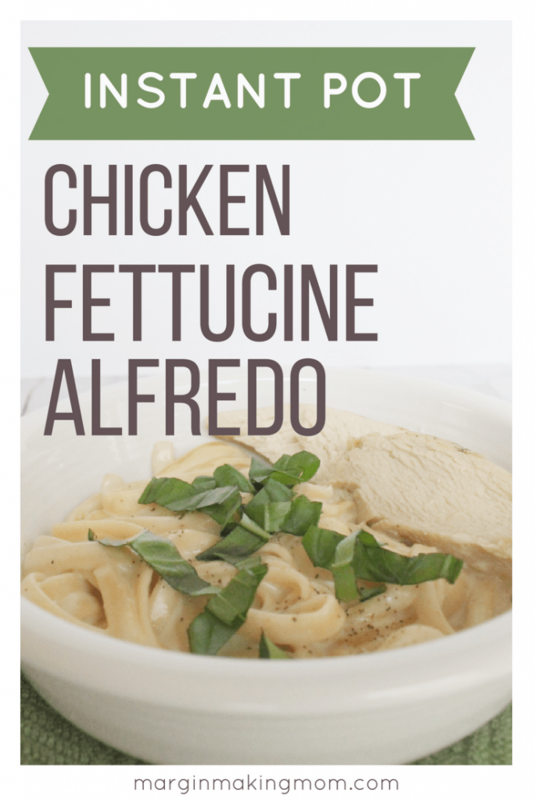 Slice chicken and serve alongside or atop the fettucine alfredo, or it can be mixed into the sauce if desired. Top with chiffonade basil if desired, as well as additional salt and pepper to taste.